I’ve been watching a new channel over the holidays called the Military Channel and a number of its shows on World War II, including the battles between the Stalin and Hitler. This lead me to head over to Wikipedia to learn more, and I came across the following chart. 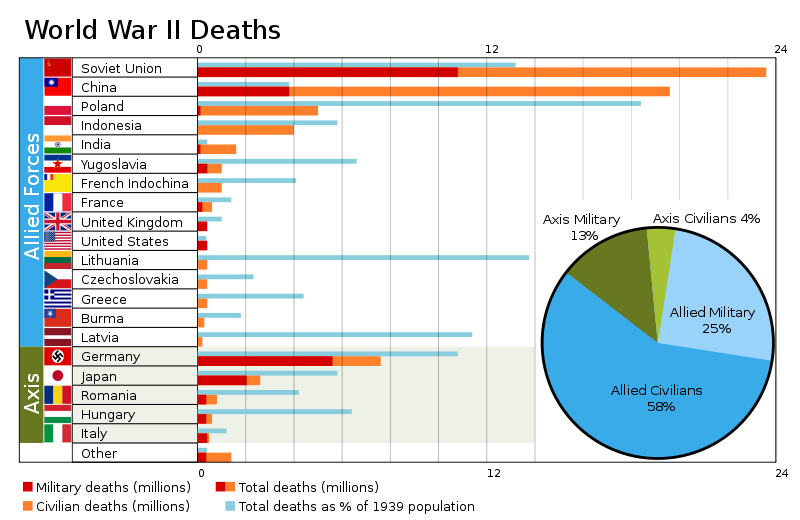 It summarizes military and civilian deaths by country, including the percentage of the population killed. Other sites I looked at had different figures so there is some variability in each of these estimates — either way, the scale of these figures is staggering and difficult to comprehend. Soviet Union had over 20mm deaths and I’ve seen estimates for China range from 10mm-20mm. Even at the low end, combined their ~30mm deaths represent ~50% of the war’s causalities. Poland lost over 17% of its population during the war. The chart includes~6 million Jews killed in the Holocaust.